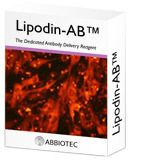 Deliver active proteins into living cells within hours with the new Lipodin™ lipid-based reagents. Lipodin™ is a protein transfection reagent that transports biologically active peptides, proteins and antibodies directly into living cells. Lipodin™ represents an alternative to nucleic acid transfection for functional studies. 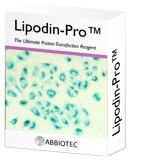 Lipodin™ is a lipid-based formulation that is added to the protein of interest minutes before cell delivery. Within few hours, protein activity can be observed in living or fixed cells. Regardless of serum addition, Lipodin™ is ideal for monitoring kinetics of biological activities in established cell lines and primary cells, including neurons. Special formulation optimized for antibody delivery.